It has been a very busy February for me. I have been digitizing some great exclusive graphics from WhimsyPrimsy and have been test stitching them…. over and over again to make sure that they stitch out perfectly for you all. 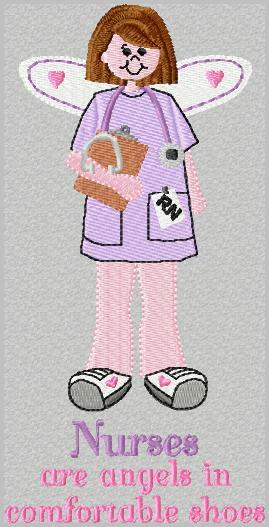 The series I am working on is called “Today’s Nurse”. As I have been searching the internet for nursing designs that apply to today’s nurse I found that there are few if any out there. So, Alice from WhimsyPrimsy drew some art at my request and I am really hoping you will like them as much as I have enjoyed digitizing them. Paul and I are busy getting ready for the new website. We hope it will be soon. Take care and hope to be talking to you soon again. Sher, I have great news. Hopefully by tomorrow or at the latest by Monday, my designs are going up for sale at http://www.oregonpatchworks.com. I have three nursing related sets for sale. Two for the 5×7 hoops, and one set of nursing miniatures for the 4×4 hoops. None of those are bigger than 2 inches. The minis were designed to fit on or over pockets, maybe over scrub pant side seams. 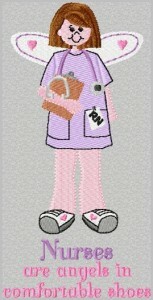 Many more nursing related sets in the making. So you want to be sure and come back and check back periodically here or at oregonpatchworks. Don’t forget to pick up the free nursing design in the free section of this site.